Sample portfolio of marketing communications projects I have crafted over the years for employers and some clients. I have executed numerous local, national and international projects that ranged from research to strategy, print design to special events, including branding and social media in between, for example. 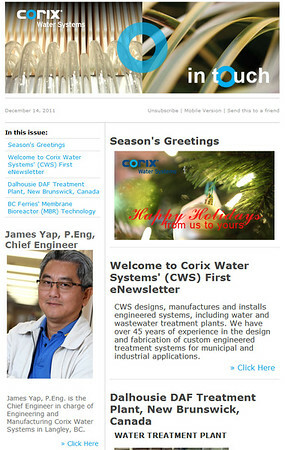 Corix Water Systems eNewsletter, where I was responsible for content writing, editing, proofing, layout and distribution.